To manage your CRM Plus subscription, access the Admin Panel, navigate to the Organization or the Subscription Information page, and click Billing. Enter the number of users you want to add. Click Make Payment. Once the payment is processed, a message will appear that the new users have been successfully added. Click Close to return to the Manage Zoho CRM Plus Subscription page. Note: If the currency used for payment is INR, the GST amount will be included in your total amount and displayed in the Confirm Order pop-up window. 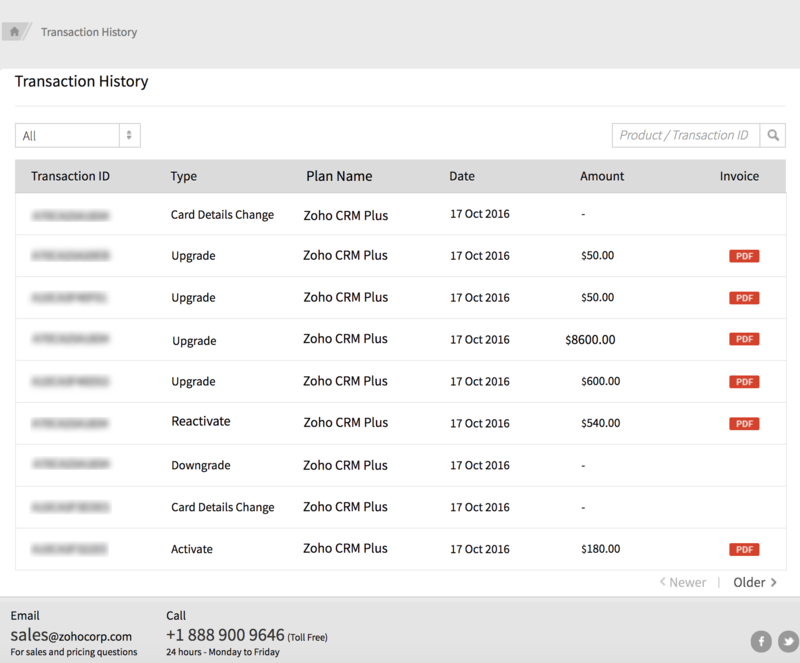 In the Manage Zoho CRM Plus Subscription page, hover the cursor over the CRM Plus Plan section​. Click Reduce in the pop-up window. Enter the number of user licenses you want to remove. Click Confirm. You will be notified that your user licenses have been successfully reduced. Purchase more add-ons at any time to keep up with your business needs. Navigate to the Manage Zoho CRM Plus Subscription page. Hover the cursor over an add-on in the list to see available actions, then click Add​ or Change displayed based on the add-on you've selected. Click the down arrow button and select the quanity or number of add-ons you want to purchase from the drop-down list. 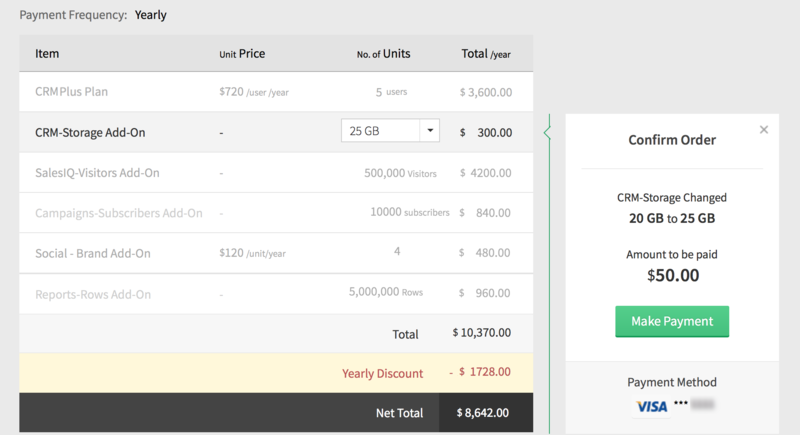 The Upgrade pop-up displays the amount this add-on will add to your subscription price. Click Make Payment. A confirmation message will appear once your payment is processed. Click Close to return to the Manage CRM Plus Subscription page. If you want to purchase another add-on, hover the cursor over another item in the list and repeat the steps above to purchase. Note: When you purchase additional add-ons, if the payment currency used is INR, the GST amount applicable will be included in the total amount and displayed in the Confirm Order pop-up window. Hover the cursor over an add-on you want to remove to see available actions, then click Reduce or Change displayed based on the add-on you have selected. Click the down arrow button and select the number or quanity of add-ons you want to reduce or remove from the drop-down list​. Click Confirm. A confirmation message will appear to let you know that the add-on has been successfully reduced. Click Close to return to the Manage Zoho CRM Plus Subscription page. If you want to remove or reduce add-on, hover the cursor over another item in the list and repeat the steps above. The billing details area lets you change your payment method for subsequent payments, update your billing address, add email recipients to send purchase notifications or invoices, and view your subscription details. Click Your Store Details on the upper-right corner​ of the page. Click Change. The Change Payment Method window will appear. To pay with a Credit Card, enter your card details and click Update. 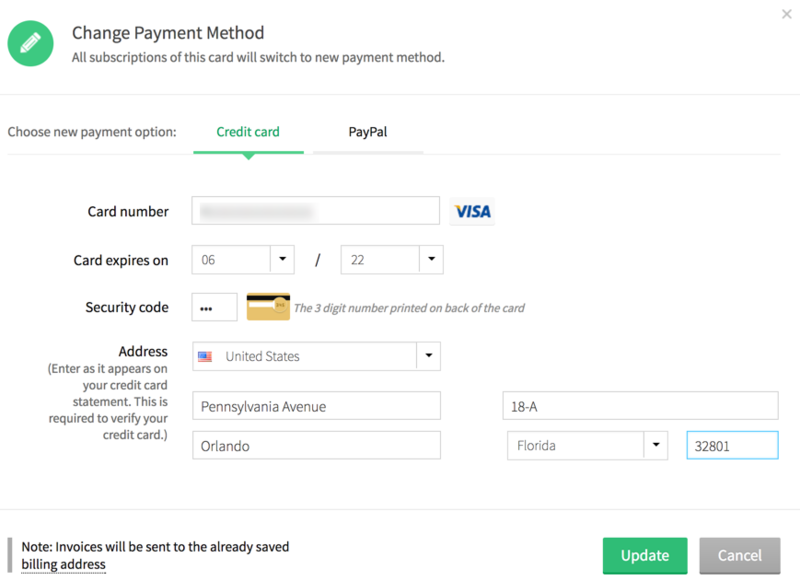 A confirmation message will appear to let you know that your Credit Card or Paypal details have been updated. Click OK to return to the Manage Zoho CRM Plus Subscription page. Navigate to Manage Zoho CRM Plus Subscription page. 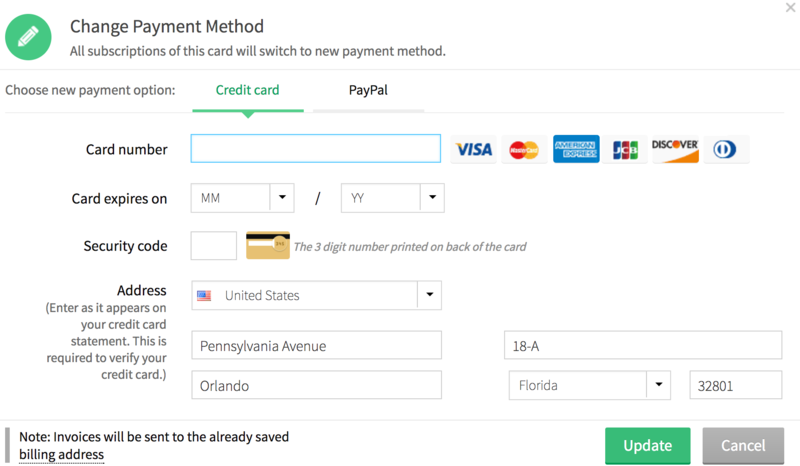 Select Payment Method from the dropdown menu. 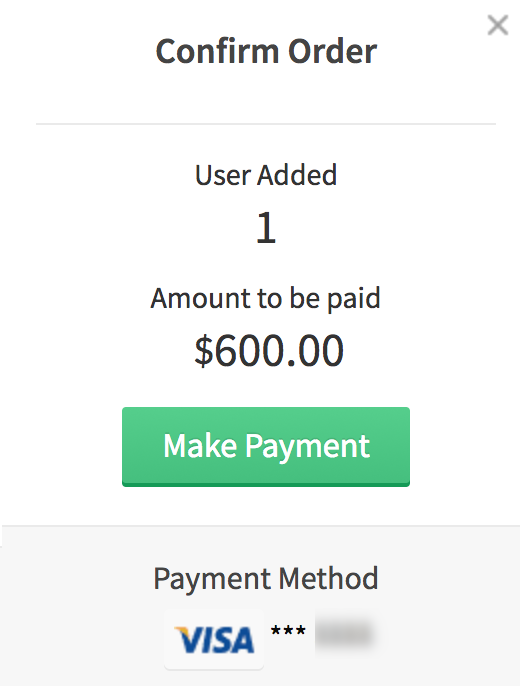 The Payment Method tab will be automatically selected with the payment details displayed in the Billing Details page​. Click ( ) to return to the Billing Details page. Click Your Store Details on the upper-right corner of the page​. Select Billing Details from the dropdown menu. The Billing Address & Other Info tab will be automatically selected with the address details displayed in the Billing Details page. You can also click the Billing Address & Other Info tab directly in the Billing Details page​ to view and update your billing address. Make your changes and click Update. You'll see a message that your billing address has been updated successfully. Click Your Store Detailson the upper-right corner of the Manage Zoho CRM Plus Subscription page. Select Email Recipients from the dropdown menu. The Email Recipients tab will be automatically selected with the recipient's name, email address, product, and action displayed in the Billing Details page​​. You can also click the Email Recipients tab directly in the Billing Details page to add email recipients. Click Add Recipient​. Enter the name and email address of a recipient. Click the plus sign ( ) to add more email recipients, if needed. Specify whether you want to email the recipients for all products or only for specific products by clicking the appropriate tab. Click Add​. You'll see the Confirm Recipients pop-up window. Select the check box to send subscription-related emails to the recipients if required, and click Confirm. You'll see a message that the email recipients have been added successfully. The email recipients' details are displayed in the Billing Details page. Note: You can click the Delete icon ( ) corresponding to the recipient's name in the Billing Details page to delete a recipient from the list. 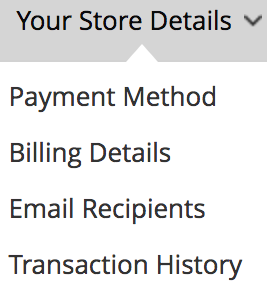 Select Transaction History from the dropdown menu. Click PDF to the right of a transaction to download the invoice for viewing or printing. Choose a relevant option from the drop-down list to view all transaction history details or view them based on transaction types such as purchases, upgrades, renewals, or downgrades. Select Filter By Period from the drop-down list to view transaction history details for a specific date range.